The rectangular hotel will feature 164 rooms and 9,762 sq. ft. of total public amenity space. 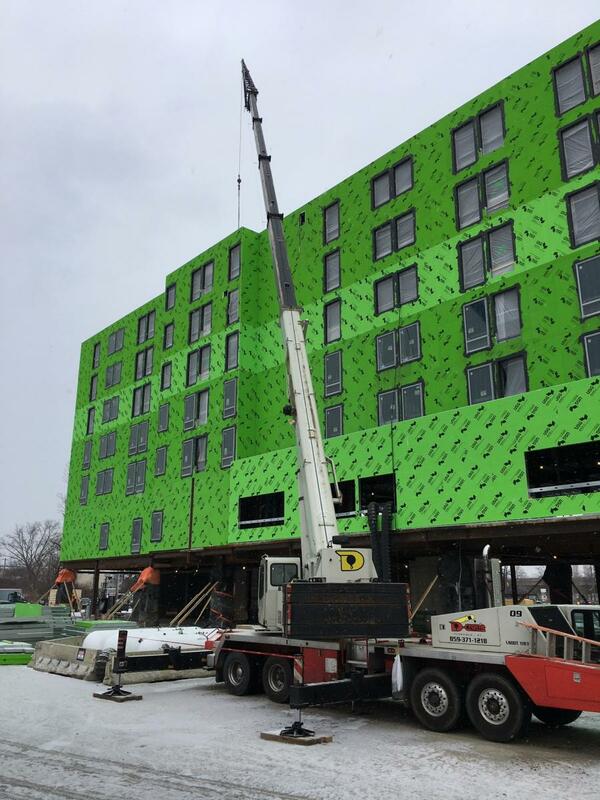 Construction began last March on the new $23 million, seven-story Aloft in Columbus, Ohio, and Welty Building Company Ltd., which is managing the project, expects to deliver the boutique hotel by September. The developer behind the project is Indus Hotels. Aloft is a chain of hotels owned by Marriott that is expanding in many parts of the country. The nearly 106,000-sq.-ft. rectangular hotel, located at 1295 Olenganty River Road — near the elevated State Route 315 and West Fifth Avenue, not far from Ohio State University's Wexner Medical Center — features 164 rooms on the upper five floors and 9,762 sq. ft. of total public amenity space. The public space includes a ground floor lobby and podium level check-in; 600 sq. ft. of meeting space; a 900-sq.-ft. fitness center; a 1,301-sq.-ft. elevated interior pool with city views; a 400-sq.-ft. café/diner; the wxyz bar, a swanky, modern, 1,170-sq.-ft. bar and lounge outfitted for live entertainment that includes a prep kitchen; and a 1,229-sq.-ft. elevated patio with ample seating, outdoor fire pits and city views, as well as a signature rooftop section clad in glass. There are 22 parking spots in the front and another 22 in the back, with one level of parking on the ground floor of the building, which also houses some of the HVAC and other systems. The project has a total of 201 spaces, which it shares with the Cap City Diner. The building is a combination of EIFS, metal and wood-grain panels, along with some block with a podium level surrounded by glass. Welty Building Company Ltd. is managing the construction of the boutique Aloft hotel in downtown Columbus and expects to complete the project by September. This will be the second Aloft hotel in Columbus and one of several in the state. "The design is modern and edgy, but maintaining a multigenerational appeal," said Warren Bath, OHM Advisors project architect. "This design is largely custom because of the need for parking under the building. Lifting the building off the ground created a lot of interesting opportunities and challenges for the design team. The building maintains its brand identity but also maintains its own identity." The design has been described as contemporary and lifestyle, with a focus on catering to millennials. The rooms have data ports and minimal carpeting. The hotel, designed by OHM Advisors, sits on 2.9 acres, with the structure occupying a footprint that is 316 ft. long by 79 ft. wide. The hotel itself has extended, two-floor, glass-clad main entrance. The design, while using many traditional elements such as square windows, has many modern touches, such as panoramic glazing elements, tapered concrete columns and midcentury ornaments to give it an iconic look. It is clad with wood-simulating metal panels, with sections featuring earth tones and various hues of purple. "The design process was very creative and dynamic," said Bath. "The brand itself is very colorful and exciting, which gave us a lot of the inspiration behind our design. Staying at this hotel will not simply be a stay, but an event. The goal was to create a building that would be as dynamic and colorful as the guests Aloft attracts." Prior to construction, the site was home to a single structure that was demolished by the city. "The demolition left behind the dirt and debris," said Kay Neubert, Welty's project manager, who arrived on site at the end of September. "We also had to get rid of the building's foundation." All the work on the project is being performed by subcontractors. Crews removed the debris and proceeded to work on the foundation. "We installed geopiers — they are concrete piers in the ground," said Neubert. "The soil was rated unsuitable, and we put down a geogrid, which was easier than digging out all of the unsuitable soils." By the end of September, having started at the beginning of that month, crews had completed the framing lines to the second floor and by December had reached the top floor. In the same month, the slab for the garage was poured. "Right now, we're trying to get a roof on," said Neubert. "It took them a couple of weeks to frame up to the sixth floor. The weather has been a real challenge — cold temperatures, the snow and the rain. With record rain falls in December and then the temperatures in January were brutal. We had a crane on site lifting all the prefabricated wall panels which helped make the job go fast. "The prefabricated panels were delivered to the site and then lifted into place," she added. "Currently we're putting the suite windows in. They're not that big [30 ft. wide by 50 ft. tall], and there's two windows per suite. They can be installed rapidly into the openings then faced nail around the outside." The work site is tight. "We've been utilizing some of the garage area for storage and other activities," said Neubert. "We didn't have too many problems, but parking was more of a problem for the employees of the trades because we utilized places to store some building materials." The urban work site is tight, and the garage area of the hotel has been used for storage and other activities. On peak days there are nearly 40 construction workers on site. Construction partners include Eagle Concrete for concrete; Casagrande for masonry; Concord Fabricators for structural steel; OK Interiors for structural metal framing; Bent Tree for carpentry including doors, frames, and hardware Mock Woodworking for casework; Valley Interiors for drywall and ceilings; Interior Surfaces for flooring; W.F. Bolin for painting and wall covering; Gutridge for sprinklers; Muetzel for plumbing; Dooley Heating & Cooling for HVAC, and Romanoff Electric for electrical and fire alarms. The roof is being installed, which will allow crews to fully focus on the interior work and installation of the finishes once it's completed. "The plumbing contractor already started on the stacks and the HVAC contractor has some of the shafts in," said Neubert. "The electrical crew is getting ready for main power with transformers coming in. We should hopefully be hanging drywall on the sixth floor at the end of March, beginning of April." Neubert is assisted by Gary McAllister, project superintendent; Nick Ciccozzi, project engineer; and John Baumer, assistant project engineer, who was recently added to the team. "Gary has 30 years of superintendent history that is helping to advance the project," said Neubert. "We're all working well together and towards the goal of getting it done." "As a two-phase project, 70 percent of landscaping, parking lot, all underground utilities and the paving was completed in the spring 2018 to service the Cap City Diner Restaurant," said McAllister. "It had a six-week shutdown for the makeover. Foundation work on the project started at the same time, with 70 percent of site open to the public in July 2018. Minimal project site is challenging, with site logistics a priority." 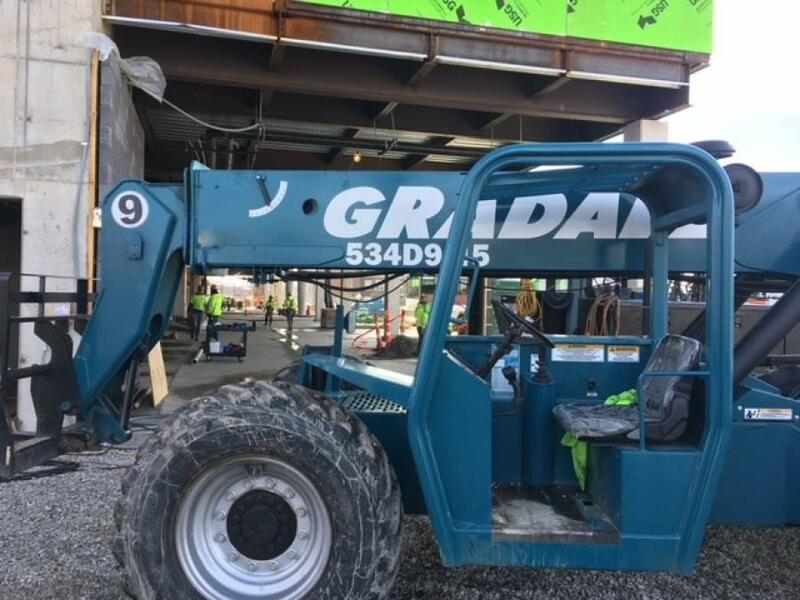 Welty will be using a material hoist, rented from Klimer, to bring material in for the interior work, while Valley Interiors will be utilizing a boom truck to get drywall into the building. With months to go before delivery, Neubert pointed out that the project is on time and schedule. "It's a normal duration project," she said, "but there's just been a lot of hurdles in bringing clarity to the drawings and what needs to be in the building in regard to Marriott standards. There's a railroad track right behind the building — four trains a day travel on it, so we had to carry stronger STC ratings because of the noise." Neubert said Welty is pleased with the morale of the crews, who are taking the weather conditions in stride. On several occasions, lunches have been purchased for the workers when milestones have been met. "At Christmastime, we bought lunch when we got to the top of the building," said Neubert. "We welcome their suggestions on how to advance the project." development Hotels Ohio Welty Building Company Ltd.